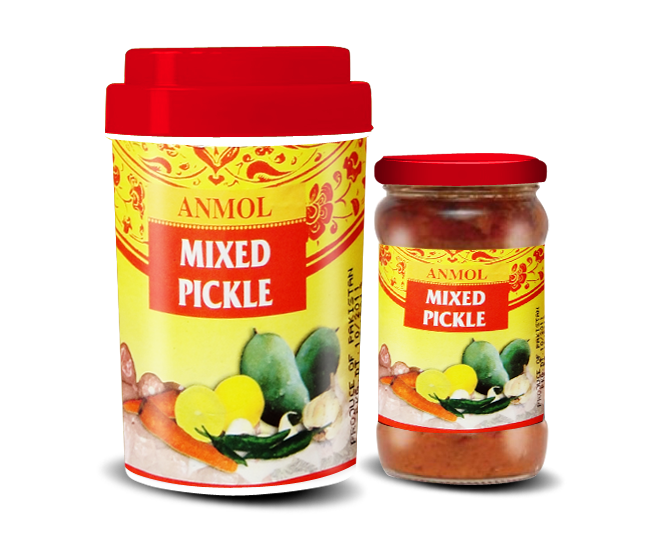 Mixed pickles are pickles made from a variety of vegetables mixed in the same pickling process. Mixed pickles are eaten much like other pickles: in small amounts to add flavor and to accent a meal. Mixed pickles occur in many different world cuisines. In Pakistani Cuisine, a mixed pickle is more likely to contain fruits (for example, mangoes and limes) as well as vegetables. Mixed pickle is prepared using oil, unlike western pickles, and is more likely to use lemon juice or some other acid as a souring agent instead of vinegar. There are regional variations in spicing and in the ingredients. 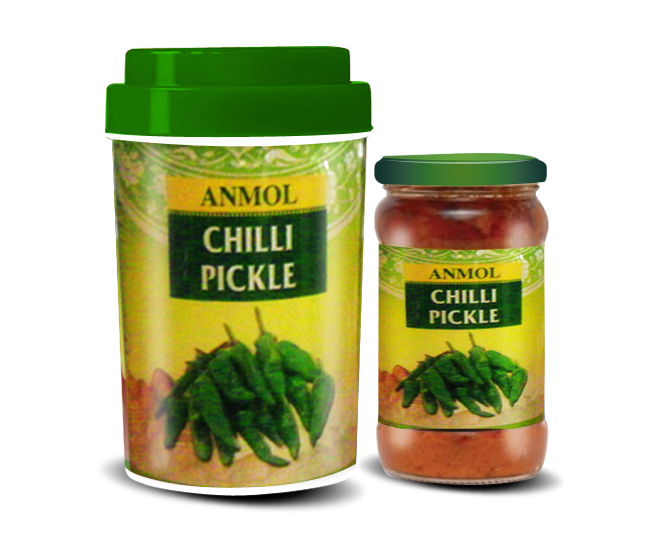 Anmol’s Pickles are famous worldwide and is available all around the world. We pick the best ingredients for our products and pack them in a way that ensures its aroma, flavor and color stays intact till it reaches our customers. Green Chili Pickle is a delightful way to spice up any meal. Pakistani meals are generally served with a variety of condiments, of which pickles are the most common. This is a rather hot and spicy pickle, not for the timid palate by any means. Green Chili pickle is made in all parts of Pakistan. Spices added in this pickle is more or less same, the only difference is the oil used to make this pickle. Filtered mustard oil or groundnut oil is used to make this pickle. Both mustard oil and groundnut oil increase the shelf life of pickle. Lemon juice is used as an acid or souring agent instead of vinegar in this pickle and a variety of spices are also added to this pickle to bring out the mouthwatering flavor. Garlic is often added in small quantities to chutneys and pickles as part of their flavouring, but as in this recipe, it can also be the main ingredient of a hot and sweet garlic pickle. The aroma of garlic is unmistakable and pungent. 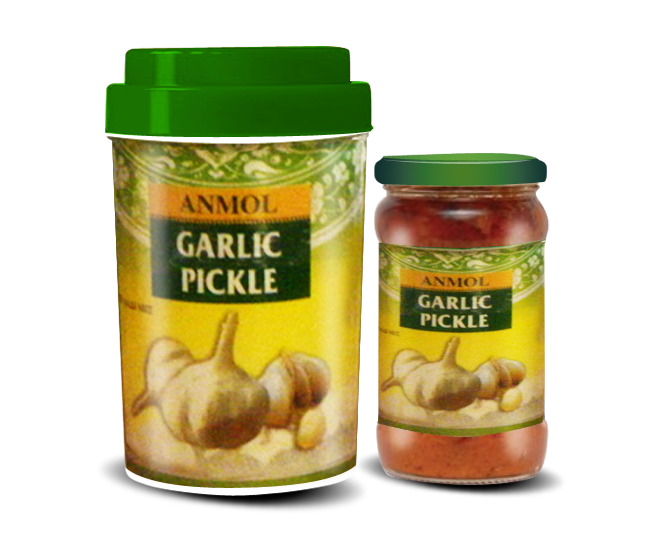 Garlic pickle is a popular. Our spicy pickle is also available worldwide. Garlic being an excellent source of dietary manganese. It is prepared by mixing peeled garlic cloves with mustard seeds and delicious spices. Mango pickle prepared using varieties of mango. This is a very popular pickle in around the world. Pickles are main side dishes and many varieties of vegetables are used. However, raw mango or tender mango is the most popular variety of fruit used for pickling. 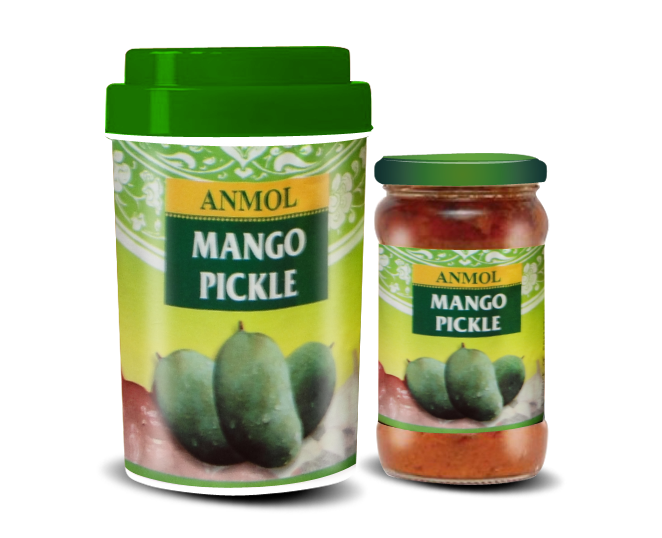 There are multiple variety of mango pickles prepared depending on the region and the spices used but, broadly there are two types of – whole baby mango pickle or cut mango pickle. Our mango pickle is prepared in the summer and kept in the sun during daytime for a couple of weeks before they can be used. They are stored in glass jars with airtight lids. The oil present in our pickles acts as a preservative the acid stops the bacterial growth. The freshness of the pickle stays intact as long as they don’t come in contact with moisture. 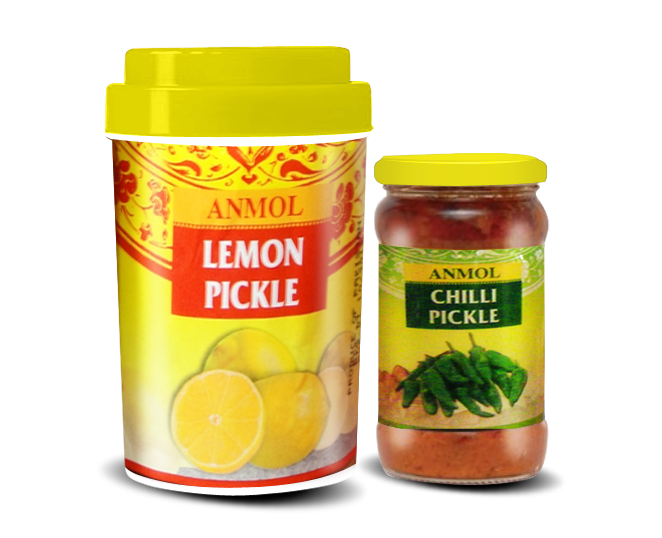 Lemon pickle is a condiment that is common in South Asian and North African cuisine. Our lemon pickle is Diced, quartered, halved, or whole, lemons are pickled in a brine of water, lemon juice, and salt; spices are included as well. The pickle is allowed to ferment at room temperature for weeks or months before it is used. The pulp of the preserved lemon can be used in stews and sauces, but it is the peel (zest and pith together) that is most valued. The flavor is mildly tart but intensely lemony.